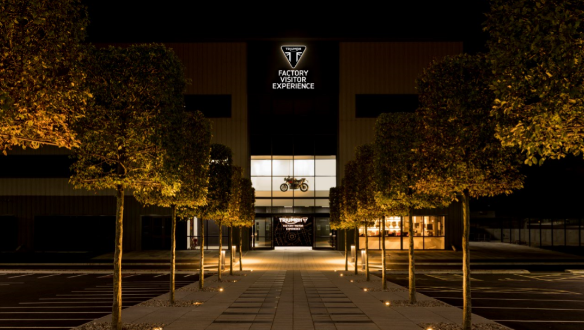 Starting November 1, Triumph will welcome enthusiasts to an all-new Visitor Centre at its factory and global headquarters in Hinckley, England. The centre will offer enthusiasts an immersive experience into the history and heritage of Triumph, one of the biggest British motorcycle manufacturers. The experience will also allow visitors to get up, close and personal with some of the most iconic motorcycles made by Triumph, including ones that have made appearances in various movies. These include the Bonneville used in the cult movie The Great Escape starring Steve McQueen, which has been restored to working condition. The Visitor Centre will also have the very Speed Triple ridden by Tom Cruise famously in in Mission Impossible: 2. Triumph commenced operations in 1902 and some of the rarest motorcycles made by the brand will be on display at the factory including the first ever Triumph motorcycle, the Triumph No 1, the Triumph 'Trusty' Model H used during World War I and so on. Visitors will also get a peek into Triumph's motorsport successes since the brand's inception, including the Bonneville that broke speed records at the Bonneville salt flats in 1956, as also the machines that have won accolades in track racing, including the Isle of Man TT, including the original 1920s TT Racer and Gary Johnson's 2014 Isle of Man Supersports TT winning Daytona 675. Apart from the motorcycles, the Visitor Centre will also give visitors a glance at Triumph's expertise in terms of the design and engineering that goes into making its motorcycles. This will include the all-new, 765cc, inline triple cylinder engine that will power Moto2 machines from the 2019 season of MotoGP. Triumph says commencement of the visitor experience is yet another landmark achievement for it in 2017, following the two major announcements it made this year. These include its tie-up with Bajaj Auto for a new range of mid-capacity motorcycles apart from its signing up with Dorna as the official engine supplier for the Moto2 class. Apart from the Visitor Centre, one can also get a guided tour of the Hinckley factory and get a close look at how motorcycles are manufactured.